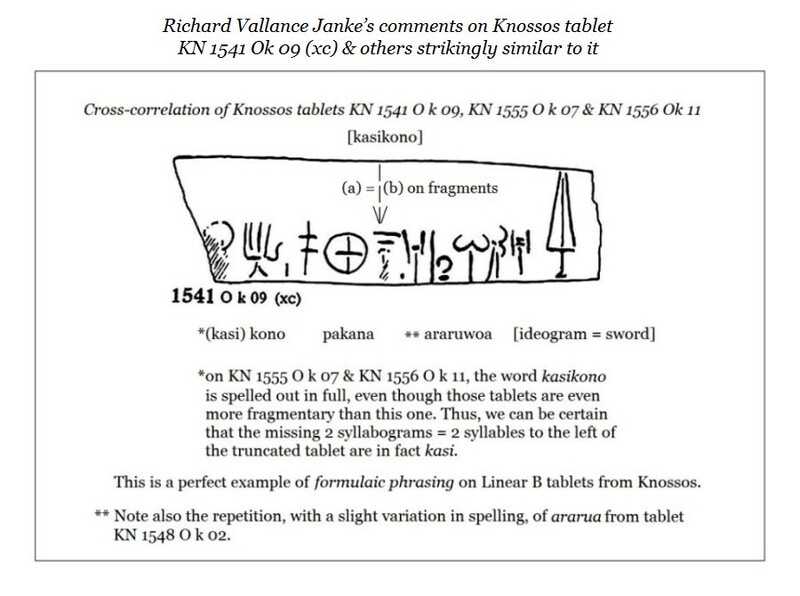 This tablet from Knossos, one of the most famous Mycenaean Linear B Linear B tablets, was first translated by Prof. John Chadwick, who did a fine job of it. There have been several good translations since then, but all of them have failed to notice certain finer details in the text. This translation hopefully brings these details to the fore. it makes more sense to interpret this reference as being an olive tree. This raises yet another question. 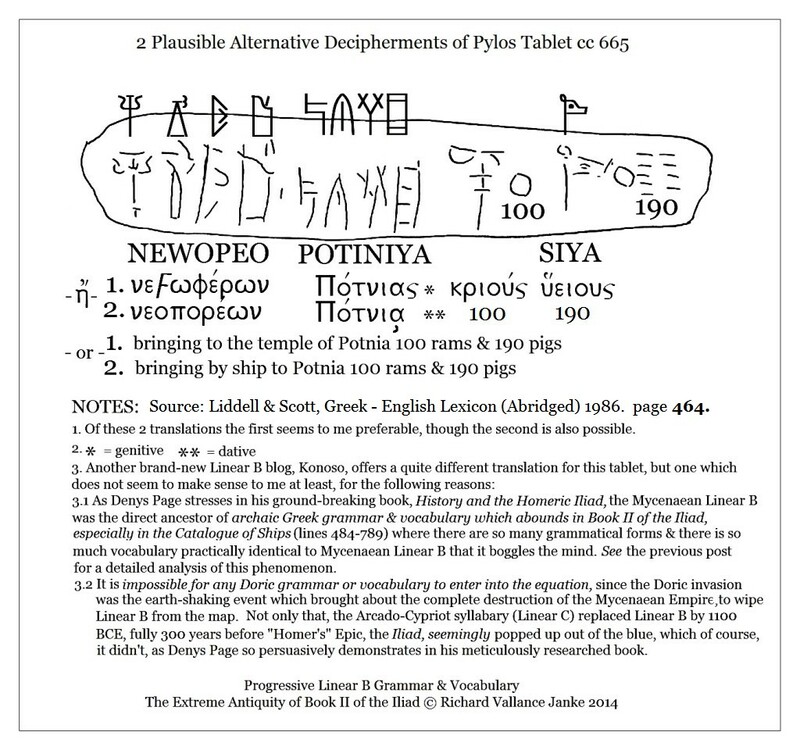 If, as it appears from the context of this tablet, the Priestess of the Winds was the priestess of Pipituna, there is probably a direct or indirect connection between this goddess and the later Greek goddess, Athena. They might even be one and the same, though this strikes me as being unlikely. On a final note, we notice that the second reference to anemoiyereya is squashed up against the right side of this tablet, which is after all only 15 cm. or about 6 inches wide. 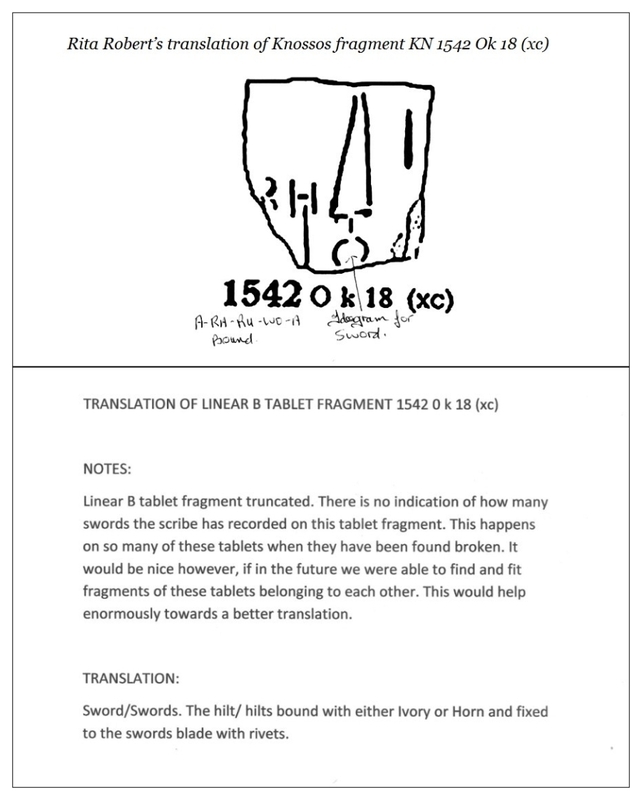 No surprise there, given that almost all Linear B tablets are very small or tiny. This offers a perfectly sound explanation why the last reference to the offering by Utano (or whatever this name is, probably Minoan) to the Priestess of the Winds only gives us the units of measurement, but of what it does not say. Yet it is pretty much obvious that this too is an offering of olive oil, since that is the only commodity offered up on the rest of the tablet. On our bog, I have stressed a great many times the extremely common practice the Mycenaean scribes resorted to over and over again to save precious space on their cramped tablets. 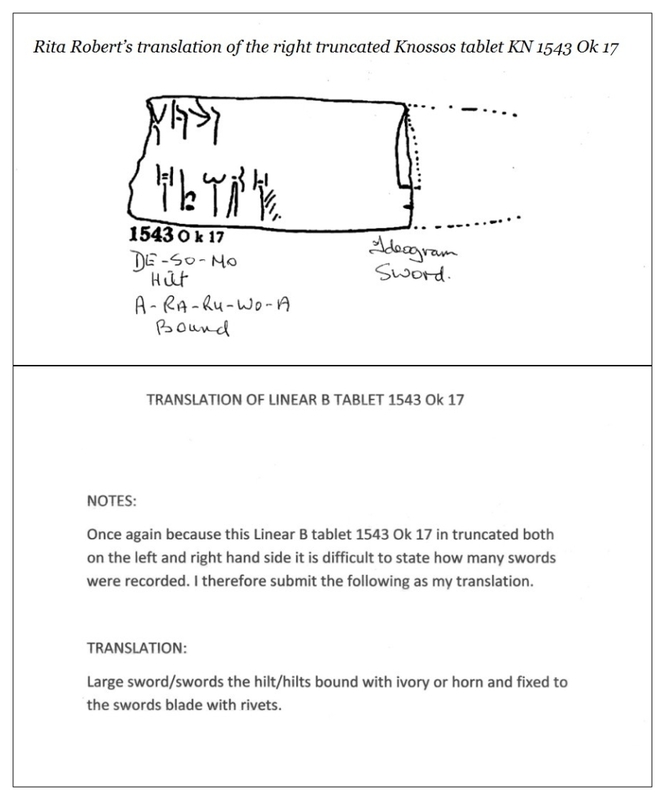 This is also the reason why they resorted to the formulaic use of single syllabograms as the first syllable of scores of very common Mycenaean Linear B words in the fields of agriculture, the military, textiles and vessels. People who regularly consult our blog already know that these are called supersyllabograms. 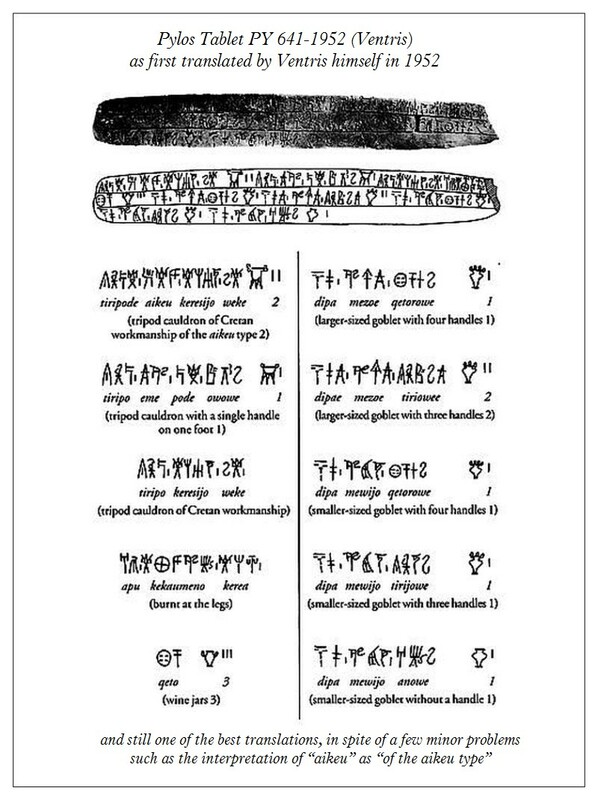 Of the 61 Linear B syllabograms, 33 are supersyllabograms, while one homophone, rai = saffron is also in the same class. 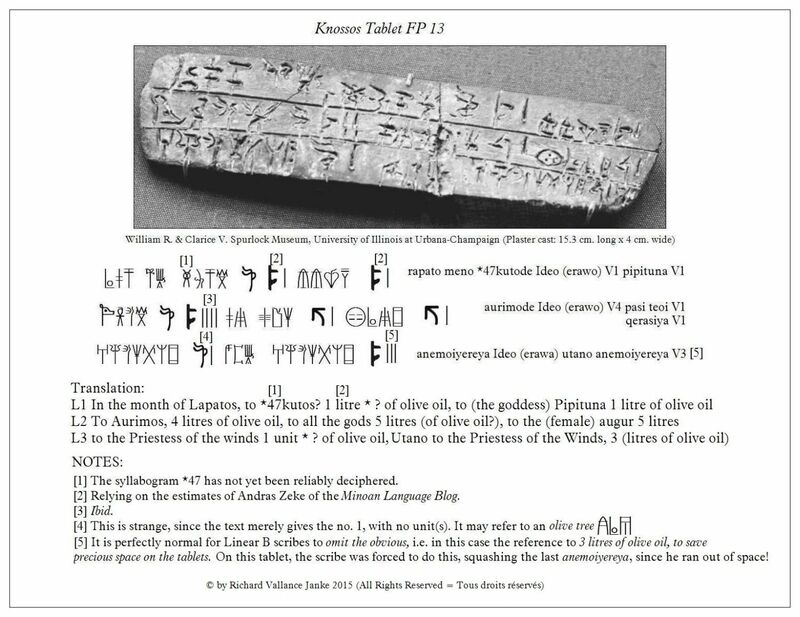 In conclusion, the preceding observations have allowed me the latitude to bring a little more precision to the translation of Knossos tablet KN FP 13. 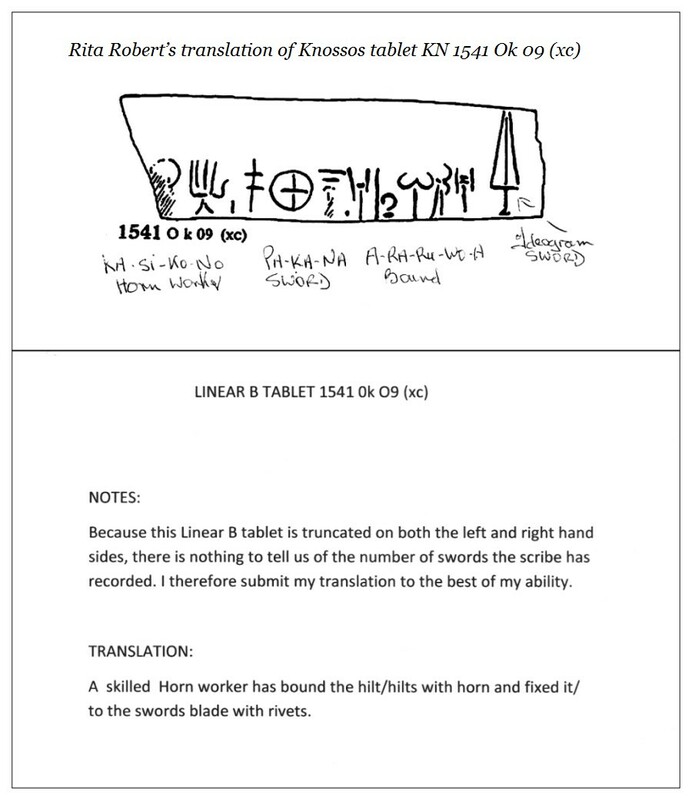 As a final aside, I for one find the use of Latin to reference the names of Linear B ideograms strange at best, and downright silly at worst. The words the ideograms replace are Greek; so the ideograms should be labelled in Greek, with an English translation for those who do not read Greek. Given that most people do not read Latin these days, what difference does it make? Little or none. For this reason, I myself always tag Linear B ideograms with their proper (Mycenaean or archaic) Greek names. Come to think of it, the second translation is actually absurd (and uproariously funny, since there is no way in heaven or on earth the Mycenaeans could cram that many rams and pigs into one of their little ships, without displacing all of the rowers and sinking the ship, unless of course they brought them to Potnia in a small armada, (kind of like they sent off to the Trojan war), which she would certainly would have appreciated! The Table above is entirely self-explanatory, but it is even easier to interpret in light of the previous 2 posts, An Analysis of the Archaic Greek in the Iliad: Book II (Lines 1-34) & The Extreme Significance of the Archaic Greek of the Catalogue of Ships in Book II of the Iliad in the Reconstruction of Mycenaean Greek grammar and vocabulary, which is the fundamental thesis of this blog. You may wish to go back and re-read those posts to get an even clearer perspective on the decipherments I propose here. Criticism and comments are welcome, especially from our new friends at our brand-new sister blog, Konoso, which I am delighted to have discovered. You can jump immediately to the Konoso blog by clicking on the Link to it in Friends & Links at the bottom of this page. Enjoy!